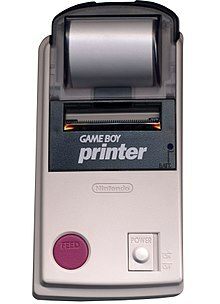 The Game Boy Printer, known as the Pocket Printer[a] in Japan, is a thermal printer accessory released by Nintendo in 1998, which ceased being manufactured in early 2003. The Game Boy Printer is compatible with all the Game Boy systems except the Game Boy Micro and is designed to be used in conjunction with the Game Boy Camera. It also prints images from compatible late-generation Game Boy and Game Boy Color games (listed below). It runs on six AA batteries and uses a special 3.8 cm wide thermal paper with adhesive backing, sold in white, red, yellow and blue colors. In Japan, a bright yellow Pokémon version of the Game Boy Printer was released, featuring a feed button in the style of a Poké Ball. The system will print a test message reading "Hello" if it is turned on while the feed button is held. According to the manual, this is used to test if the printer is functioning properly. To get around using six AA batteries (1.5 volts each) for the printer, a single 9V battery can be used if wired properly, because the printer requires 9V DC. Pokémon Card GB2: Great Rocket-Dan Sanjō! A roll of the American Game Boy Printer paper came in red, blue, yellow and white, with an adhesive backing. It had a width of 38mm and a diameter of 30mm, with a 12mm cardboard spindle in the centre. A typical roll had 390–400 cm of length. When a picture printed from the Game Boy Camera, it would print with a .5 cm margin above and below the picture and print the picture at a 2.3 cm height. This would give the total of 3.3 cm height per picture. The Game Boy Printer paper refills boasted up to 180 pictures per roll. With the math, the typical roll could only take 118 pictures. The paper is now hard to find; it could be substituted with a 1.5-inch-wide (38 mm) thermal paper without repercussions on the printer. The communication between the Game Boy and the Game Boy Printer is via a simple serial link. Serial clock (provided by the Game Boy for the printer), serial data output (from Game Boy to printer) as well as serial data input (to Game Boy from printer). The Game Boy sends a packet to the printer, to which the printer responds with an acknowledgement as well as a status code. Communication is via the Game Boy sending to the printer a simple packet structure as shown below. In general, between the first "sync_word" til the checksum is the Game Boy communicating to the printer. The last two bytes of the packet are for the printer to acknowledge and show its current status code. Command may be either Initialize (0x01), Data (0x04), Print (0x02), or Inquiry (0x0F). Payload byte count size depends on the value of the `DATA_LENGTH` field. Checksum is a simple sum of bytes in command, data length, and the data payload. This packet is sent without a data payload. It signals to the printer to clear the settings and prepare for the first data payload. The data packet is for transferring the image data to the printer data buffer. The typical size of the data payload is 640 bytes since it can store two printable rows of 20 standard Game Boy tile (2 bit color in 8x8 pixels grid), of which the Game Boy tile takes 16 bytes. This commands the printer to start printing. It also has 4 settings bytes for printing. Used for checking the printer status byte. This may be for checking if there is enough data in the printer buffer to start printing smoothly or if the printer is currently printing. ^ Japanese: ポケットプリンタ, Hepburn: Poketto Purinta? ^ "Mad Catz GB to PC Camera Link Cable (GBC)". November 20th, 2010. ^ Frohwein, Jeff (April 5, 1998). "Game Boy to LPT Cable diagram". Archived from the original on February 23, 2010. Retrieved July 17, 2009. ^ Eyre, Martin (September 18, 1998). "Gameboy Printer Emulator". Archived from the original on October 11, 2011. Retrieved July 17, 2009. ^ "game boy printer problems". Flickr. June 10, 2006. Archived from the original on January 20, 2017. Retrieved July 17, 2009. ^ Make your own Game Boy Printer Paper video tutorial. Retrieved July 17, 2009 – via YouTube. ^ "GB Printer interface specification". December 1, 2001. Archived from the original on June 15, 2009. ^ a b "In Depth: The Game Boy Printer". Shonumi. September 7, 2016. Retrieved April 11, 2017. ^ Huderle, Marcus (June 29, 2013). "Gameboy 2BPP Graphics Format". Archived from the original on June 25, 2018. Retrieved April 11, 2017.